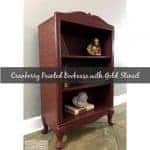 I often avoid modern pieces for makeovers and prefer to stick with the older, vintage pieces. 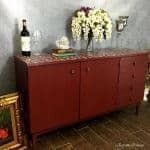 But this pair of modern dressers were brought to me by my customer looking to give them an updated look. She wanted something in the gray family but a bit fancier than just plain gray. 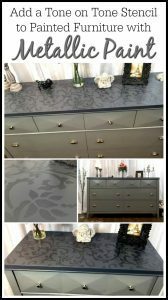 After much thought, she decided on a gray body with dark gray top and metallic tone on tone stencil top! 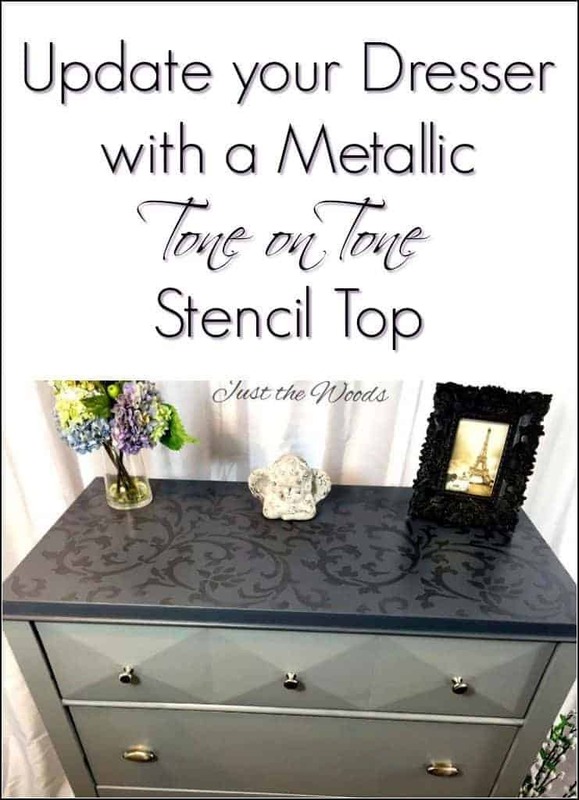 Disclosure: This tone on tone dresser post contains sponsored links from Cutting Edge Stencils. All opinions are 100% my own. This post also contains affiliate links for your convenience. 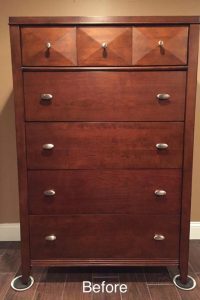 This pair of modern dressers are sleek with straight lines and simple hardware. 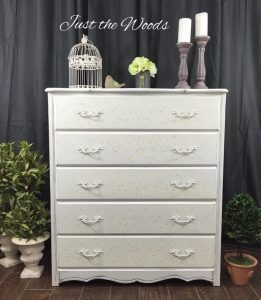 One tallboy and one low dresser. 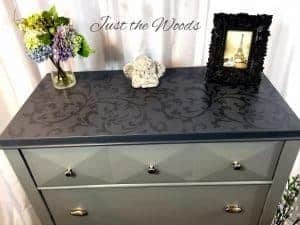 This plan worked out wonderfully because I had recently been in contact with Cutting Edge Stencils who just came out with multiple new stencils. 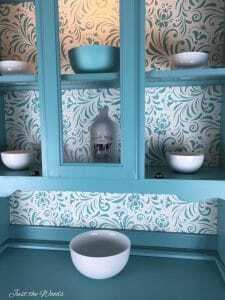 My customer chose the very pretty Victoria Scroll all over stencil for the dresser tops. Swoon! 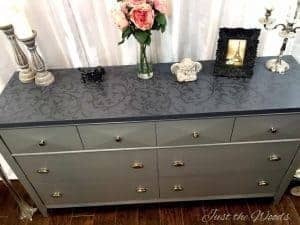 The dressers were both prepped and cleaned as usual and painted a creamy elephant gray on the bottom with a custom mixed darker version of the same gray on top. 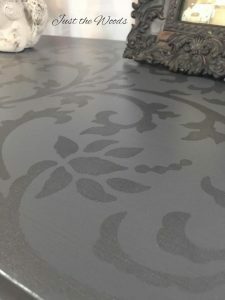 The stencil was then done using a foam roller, provided but Cutting Edge Stencils in a custom mixed dark metallic silver. The tone on tone of the stencil gives an almost ghost appearance. Depending on how the light hits it the shimmer appears to come and go. 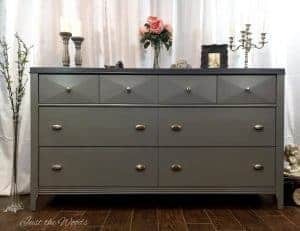 The dressers with their very straight clean lines tied with the tone on tone top give an overall elegant appearance. 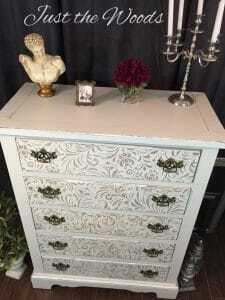 As it turned out the original hardware was left unchanged and continue to compliment the updated dressers beautifully. I sure hope my customer loves them! What do you think? Love this! Girl, where do you find the time!? Thanks for sharing!! Hi Kandice love the colour & specifically the two tone with the stencil, but I can’t seem to grasp the before with the after as the before photo is taller & not so wide as the after i.e. 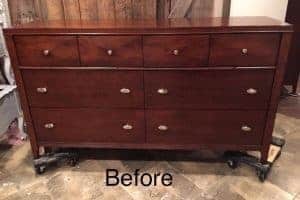 The before has 4 large drawers & 3 small drawers – the after has 2 large drawers side by side 4 small drawers – perhaps you chose the wrong before picture? Thank you Kandice for pointing that out – silly me? I am a big fan of your ‘creations’ you create some beautiful furniture ? What a great way to add subtle detail to a piece as well as some uniqueness! 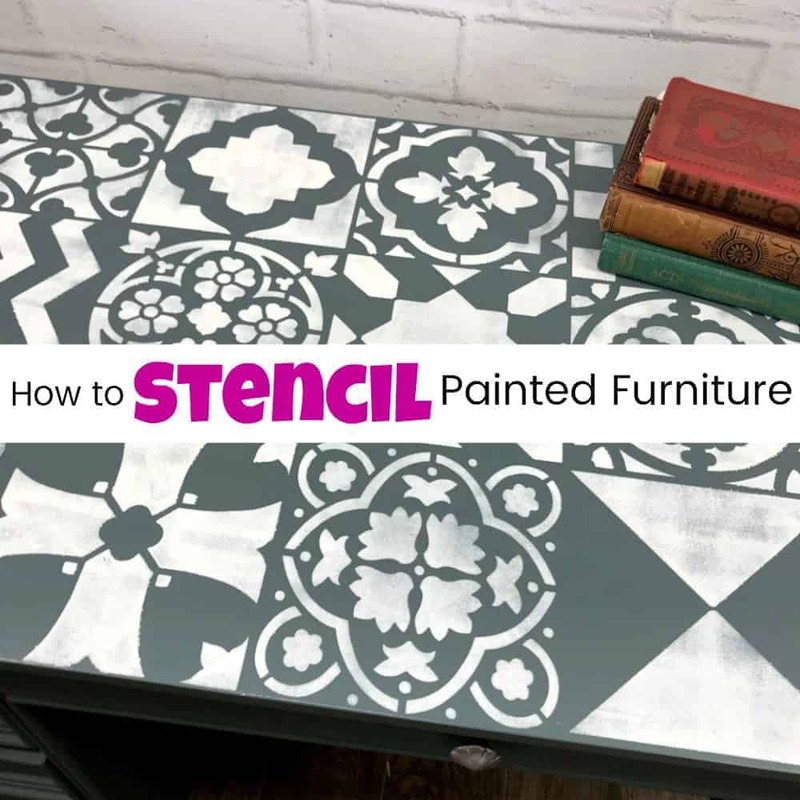 I love cutting edge stencils and their blog … the possibilities are endless with stencils! The tone on tone is lovely! Well done! Wow, that is truly stunning! 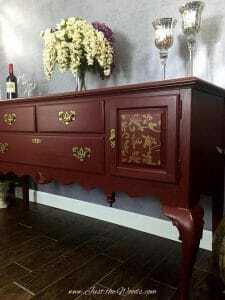 I’ve never had much courage when it comes to stenciling but, oh my gosh, this is beautiful, I might have to try it now! When I saw the thumbnail picture over “Talented Tuesday” it catch my eye and had to came to see it better… I LOVE it!!! It turned out so elegant!! I am not very keen about dark colors but I do really like this piece a lot!! I would love to invite you share it with us at the Sweet Inspiration party I host every Friday to Tuesday, so others can be inspired too.